On Monday we explored textures with printmaking! 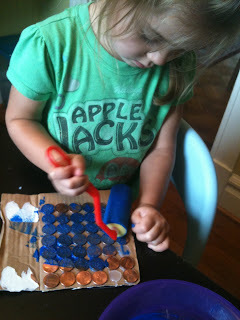 We created three different textures, the first using pennies. I got a handful of pennies out of our change jar and hot glued them down to a piece of cardboard to create a coin printing plate. The second texture we created was by taking a piece of leftover Styrofoam from some fish we bought. After washing well, I cut the Styrofoam into two pieces and gave one each to the Bee and Bean. Using plastic forks they poked the Styrofoam however they wanted to create a interesting texture. Our last texture plate came from some bubble wrap we had left over from a package. After all three of our different texture plates were ready, we selected 3 paint color and I put the colors onto plastic plates. Using a foam roller the Bee rolled the paint out onto the roller and then onto the texture plates. 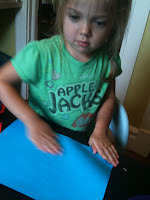 After putting the paint onto the different textures she then took a piece of paper and placed it on top of the texture rubbing the back of the paper a little with her hand. 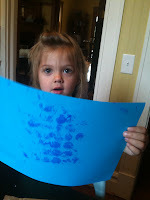 Then my favorite part of printmaking, she pulled the paper off of the plate to see the texture she had printed. revealing the print is always like magic! After she got the hang of how it worked she spent a long time experimenting with printing the different plates and layering her prints onto the same paper. The finished prints were really neat and would be fun to use as a card or wrapping paper. oh lots of printing fun! Must try some printing with foam! I love how she used a roller to paint the colors on - and the finished product! How fun! Glad I found you through It's PLaytime. Thanks katepickle, I love printing with foam and the possibilities are endless. 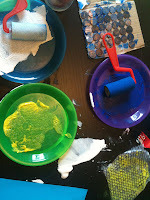 Quirky Momma: She loved using the roller:) So glad you found me, I always find great stuff in Playtime too! like the idea and the post...it might help me when use for plastic card printing.